The operator of streaming sites detailed in a UK High Court order obtained by the MPA has been arrested. Rainier Tamayo was reportedly arrested while uploading movies to his site but tracking him down probably wasn’t that hard. The computer graduate included his own name in his site’s URLs. pirate-cardFor the past several years, the Hollywood studios of the MPA/MPAA and the major recording labels have regularly attended the UK High Court to force ISPs to block pirate sites. Following a slow start in 2012, a year later a wide range of sites were blocked, including EZTV, Movie2K, PrimeWire, Vodly, YIFY-Torrents, SolarMovie and TubePlus. Dozens of additional sites were targeted in 2014 and 2015, but with so many sites operational, a sizeable task lay ahead. In May 2016, the MPA obtained a new injunction, this time against several streaming sites including Putlocker, WatchFree and Couchtuner. 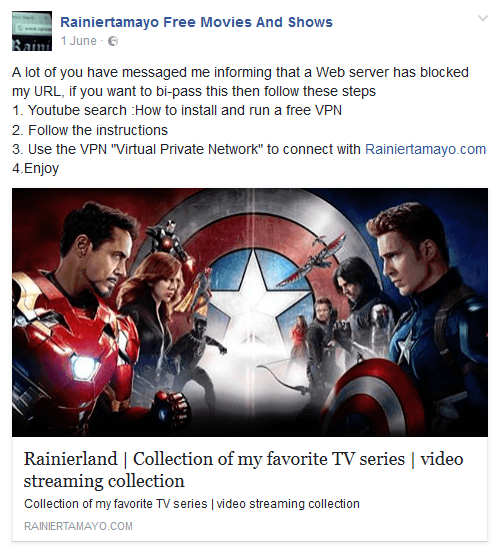 Also included in the package were Rainierland and RainierTamayo, two popular domains for a site showing the latest movies and TV shows. Soon after the ISPs put their blocking measures in place the site’s operator began receiving notifications from users having difficulty reaching the site. In response, he published a Facebook post containing advice on how to circumvent the blockades. Earlier this month, however, the site experienced much bigger problems. According to media reports in the Philippines, the operator of Rainierland and RainierTamayo was arrested following a complaint from Australia-based anti-piracy outfit Internet Fraud Watchdog. Members of the Philippine National Police Anti-Cybercrime Group swooped on the computer science graduate who was reportedly “caught red-handed” as he uploaded movies to his site. In a sign that the authorities wanted to send a message, the arrest was televised on national TV, including Tamayo being put into a cell with several other prisoners. Internet Fraud Watchdog (IFW) Executive Chairman Ken Gamble said they had been “investigating a person running a number of websites that were pirating a lot of US movies, big blockbuster movies online.” It’s not clear how complex that investigation became but the suspect certainly didn’t make himself difficult to identify. Local media identified the operator of RainierTamayo.com as a local man called Rainier Tamayo. IFW say they were able to trace him through his website which had been leaking films online since 2011. Perhaps pointlessly, all domains currently registered to Tamayo are WHOIS-protected, despite featuring his name in various forms in their URLs. Police say that during the raid they also seized several computers, laptops and routers but that is likely to be the least of the computer graduate’s worries. According to police sources, if found guilty Tamayo could face up to 12 years in jail for violating copyright law. The sites in question are currently still up but appear to be non-functional when it comes to playing movies. Tamayo didn’t immediately respond to TF’s request for comment which raises the possibility that he’s still being held.